As I am getting to grips with hydrangeas in this part of the world where they grow so well, I have been playing around with hydrangea colourant. 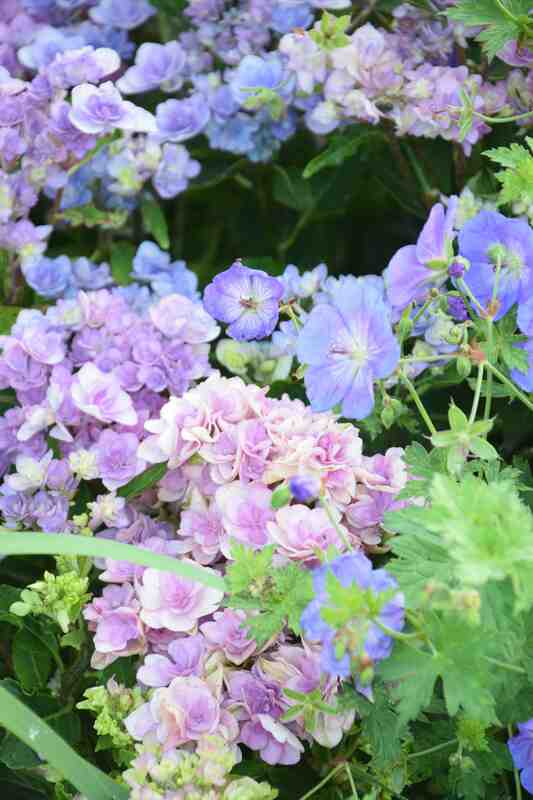 Most forms of Hydrangea macrophylla have flowers that can magically change from red or pink to blue according to the soil acidity. It is not actually the soil acidity itself that affects the flower colour but the availability of aluminium in the soil. Aluminium is needed to produce the blue pigment in the blooms and it is more readily available in acid soils. 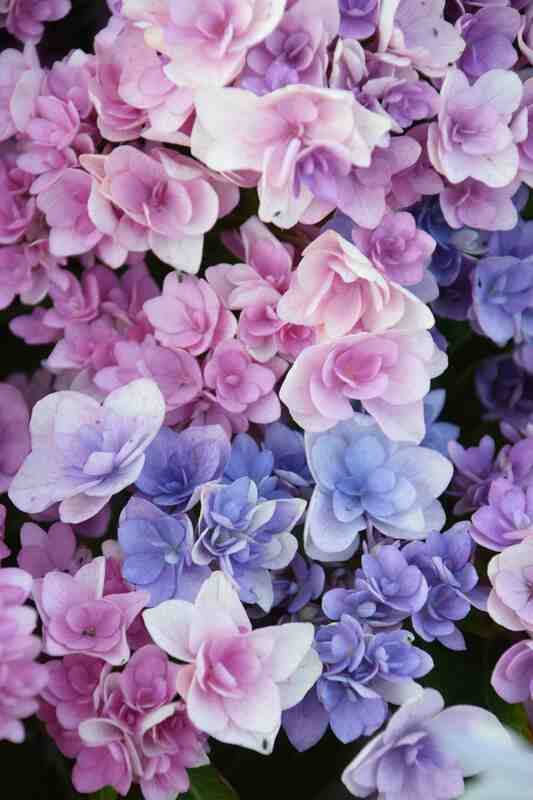 You can turn pink hydrangeas blue by adding hydrangea colourant (aluminium sulphate) to the soil whether the plants are growing in pots of the open ground. Old gardeners used to bury nails or other iron items under their plants to make them blue. As the iron rusts the iron oxide acidifies the soil and makes aluminium more readily available. I put four ‘You and Me’ at the edge of the blue borders but although the soil tested slightly acid they flowered pink this year. Or at least they were slightly mauve at best. So for the past month I have been watering the plants with 4litres of aluminium sulphate solution every week. You can see that the results are not instant. The photo at the top is before I treated the plants. 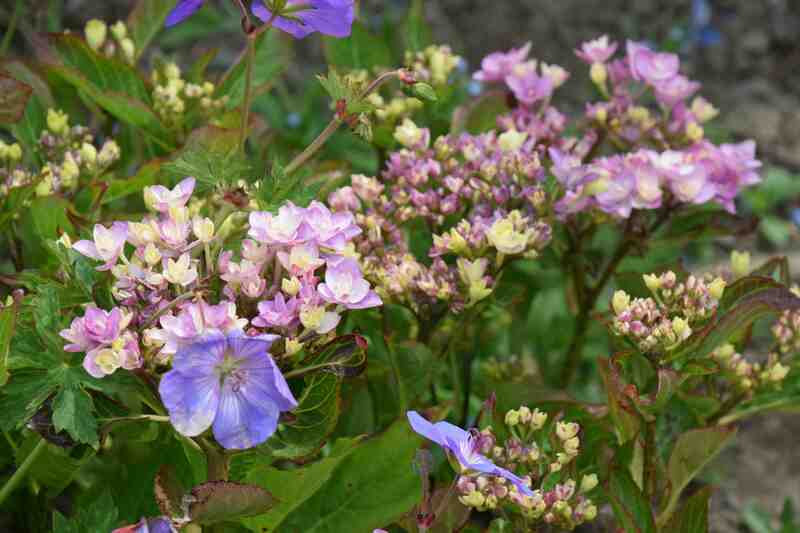 The flowers were already forming and those that had already developed have remained pink or have just turned mauve. Flowers that were only tiny when the first dose was applied have developed the best colour – well are the most blue. From this you can see that if you want your hydrangeas blue you have to apply the colourant before the flower buds get too big. Some people really dislike the mauve shades you get from ‘in-between’ colouring but I like it. But I will be happier next year when the flowers are truly blue. Even so it’s pretty cool to have this range of colours all on one head of flowers.